What would immediately come to your mind when a world-famous chef decides to open a restaurant far away from an expected downtown location, and plunks it in a suburban mall? Is your response a side-eye glance? Did you murmur a suspicious "hmmm" to yourself? Did you wonder what Chef was smoking to come up with that decision? Regardless of your reaction to the news, it seems that Chef Jamie Oliver has ignored what traditionally or typically should happen with celebrity chef restaurant openings, and instead has opened a place far away from the downtown madding crowd. There is little doubt regarding the many incredible accomplishments of Mr. Oliver. I have heard nothing but great things about his restaurants in London, and I personally think that he's a fantastic chef and cook. Come to think of it, I am a big fan of anyone who has the guts to tell Vegans to knock it off and just enjoy food. 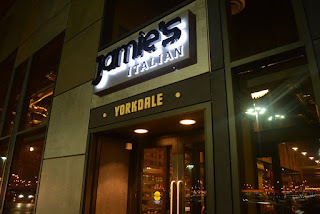 So believe me when I say that it was a shock when I heard that Jamie Oliver's first foray into the Canadian culinary scene would be at Yorkdale shopping centre - an upscale mall located about 40 minutes away from the downtown core. But in a mall? Oh I get it now Mr. Oliver. With this first restaurant in Canada, clearly you're goal is to become a chain. Well congratulations and good luck on that venture. Ah well, we'll soon find out if there is a method to his madness. As with anything he does, there is definitive strategic thought and value to opening up a restaurant in a mall, but especially at that particular mall. Yorkdale is one of the busiest shopping centres in the country, and caters to a wide variety of shoppers from all income levels. It is practically a guaranteed spot to have a hit restaurant, unless of course the food being offered does not live up to the celebrity chef who is creating and hyping up the menu. And that's the rub. Jamie Oliver's entry into the Canadian culinary world landed with a thud. I sincerely hate the following word 'meh', but nothing else came to mind after my dining experiences. Not even just 'meh', but a decidedly, definitive, no confusion whatsoever 'meh'. Are you ready to find out why? Good, then lets begin the journey of 'meh'. Now generally when a restaurant decides to locate in a shopping mall, you're going to get an entirely different type of dining experience and in particular, a different type of professional service pool than you would find in a typical, mid to higher end downtown establishment. Now I don't know about you my fellow reader, but I always find it disconcerting when there are four or five staff clustered at the front entrance of a eating establishment. I think to myself, either too many employees or not enough customers - or both, which is not necessarily a good sign. What makes things more confusing and irritating to an already uncertain opening restaurant experience, is a reservation policy that works well in theory, but is utterly worthless in practice. Here is my question to you Mr Oliver - why bother even having a reservation policy if you're staff are plunking people in spots that are horrible despite having made reservations' weeks in advance to avoid exactly that issue? Is it fair that "walk in's" seem to be directed to some of the better tables in the house? And worse, when you ask to be moved from a location that guarantees a cold air draft as you're seated next to the front door, only to proceed to punish the people by putting them in an even worse location? Surely you are you aware that people talk and remember slights like this. And then here comes the waiter. If this was a downtown location, come to think of it, ANY location I'd have him fired. Yes, he was THAT type of waiter, you know the kind. Less than enthused when it's a table of couples, or God forbid a single person, but give him a table filled with pretty, young women? Well didn't he just come to life. Clearly I was very annoyed by this point in my culinary foray at Jamie's restaurant, and the food was not even ordered yet. So I was hoping that the food would raise the dining experience that has so far been pretty dismal. We started with some 'nibble's: Arancini Margherita, which was stuffed and tasteless risotto rice balls that contained piri piri chillies, a drab tomato sauce, mozzarella and Parmigiano Reggiano cheese. You would think with all of those ingredients that it would not be lacking in flavour, but it did, rendering it a dull, boring and bland dish. I was sincerely at the point where I was this close to eating our waiter with some fava beans and a nice chianti, but my dinner companions preached the gospel of patience. So I took a sip of wine and patiently waited for the mains to arrive. Thankfully my sausage pappardelle saved what was truly an underwhelming start to the meal at Jamie's Italian Restaurant. Perfectly cooked al dente pasta with a gorgeous, velvety sauce made of sausage and fennel, made my eyes pop and my mouth water. I'm not a huge fan of fennel, and it was slightly overwhelming the dish for me, but I was told by my Italian friends that this is exactly the way it should be. My dining companion ordered the crab spaghetti, and after exclaiming how bored they were with the appetizer, again, the word 'meh' came up to describe their feelings about the pasta. The dish contained garlic, capers, chilli, fennel, parsley, anchovies, lemon & olive oil, but yet when I tasted it, it seemed to have very little actual crab flavour. We had ordered fried polenta chips as a side dish. Resembling fritters more than fries (which really didn't matter), it turned out to be the best thing I ate so far that night. With the rosemary, olive oil and drenched in Parmigiano Reggiano cheese, the flavours melded together beautifully, and we all sighed with delight so much that it almost made us forget that we had to remind our waiter to bring it to the table. Almost. A fabulous dessert of lemon meringue cheesecake followed our Mains. When I asked the waiter if it was made in-house, I was told that it was provided by Dufflets bakery - a local Toronto favourite, but it was Jamie's recipe. Again, it didn't matter at that point in the evening whose recipe it was or whom even created, it was absolutely fantastic. A wonderful way to end what was truly a disappointing meal. So with that last statement, you might still be wondering why I called my overall experience at Jamie's 'meh'. Well, that's mostly because a few good dishes doesn't save the fact that crappy service, a hard to get to location, plus an environment that truly screamed "this is a mall restaurant", all conspired to make a trip to Yorkdale Mall the dullest culinary travel experience I've had in a long, long while.